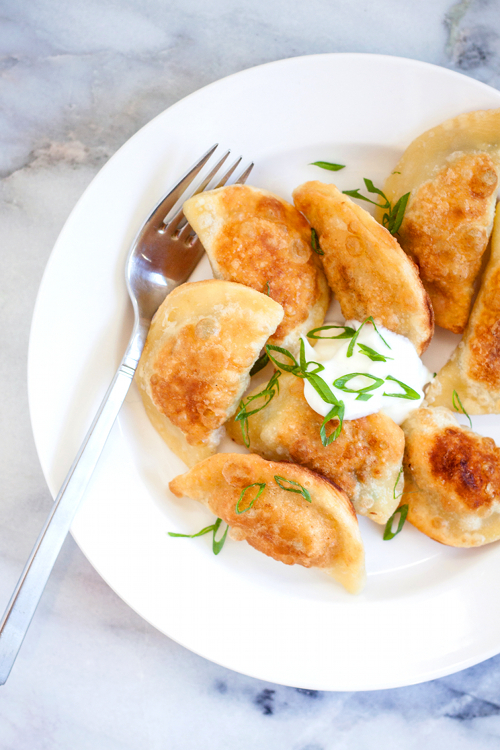 I always love Pierogi, but never felt inspired to whip up a batch and make them myself. And I'm wondering what took me so long to finally do it. Because I could have been in Pierogi heaven sooner. Way way sooner. 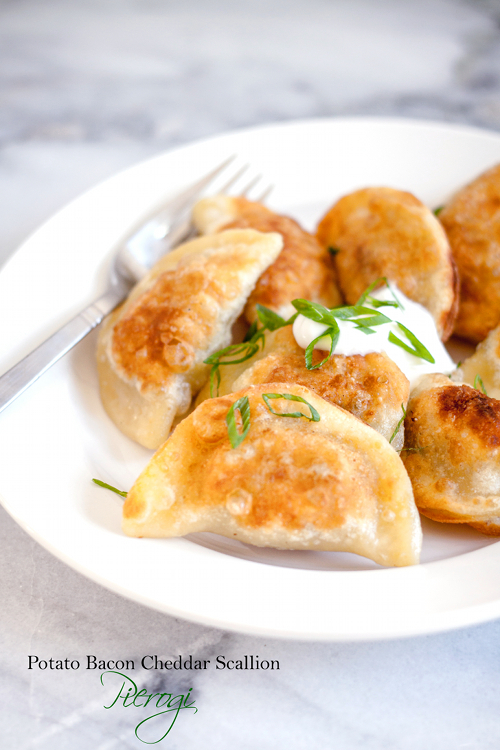 Because nothing's more comforting that sitting in front of the TV while it's raining outside, with a plate full of these delicious potato pockets drizzled with sour cream. To make the dough: In a large mixing bowl combine flour and salt, add sour cream, egg and salted butter and mix together. Knead the dough for about 5-10 minutes, until the dough is elastic and pulls away from the bowl. Wrap with plastic and store in the refrigerator for 30 minutes to overnight. Boil the potatoes in the pot until tender. When the potatoes are cool enough to handle, peel the skin and mash until smooth. Cook the bacon until crispy, then crumble and add to the bowl of mashed potatoes. Add the rest of the ingredients into the bowl and mix thoroughly until well combined. Allow the filling to cool completely, then roll the filling into 1-inch balls. Roll out the dough on a floured surface to about 1/8-inch thick. Using a round cookie cutter (about 5-inch in diameter), cut the dough into circles. Place a ball of filling in the center of each dough circle. Using your finger or pastry brush, wet the outer half of the circle, fold the dough in half and preset the edges to seal. Repeat with the remaining ingredients. Bring a pot of salted water to a boil. Boil the dumpling in small batches until they float to the top. Remove from the water with a slotted spoon and let dry. In a meanwhile, melt a stick of butter in a large frying skillet. Fry the dumpling until brown and crispy on each side. Serve with sour cream and chopped scallion while they're still warm. Love pieorgi! Never made them myself before though - this is definitely something I need to make. Priscilla, these look so mouthwatering! I could devour a plateful right now! Love your recipes and your photography is fantastic! Thanks for sharing! Thanks for sharing such an awesome post. i really enjoyed and got some helpful information. keep posting stuff like this. I wanna taste it. Please. it was great visited here. GREAT, awesome blog layout! How long have you been blogging for? you made blogging look easy. The overall look of your web site is Wonderful, Driftwood Mirror Attention Driftwood lovers!! the latest range of Driftwood at prices your eyes will never believe!! Hurry!